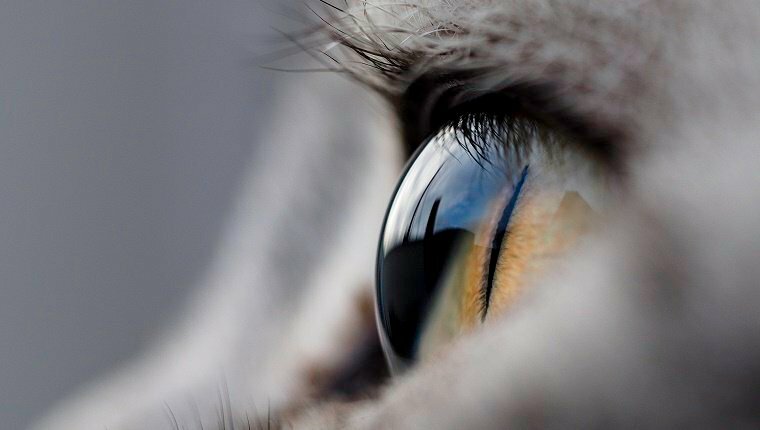 A cat’s eyes are beautiful, but they’re also very sensitive. Cats can develop everything from viruses in their eyes to glaucoma. 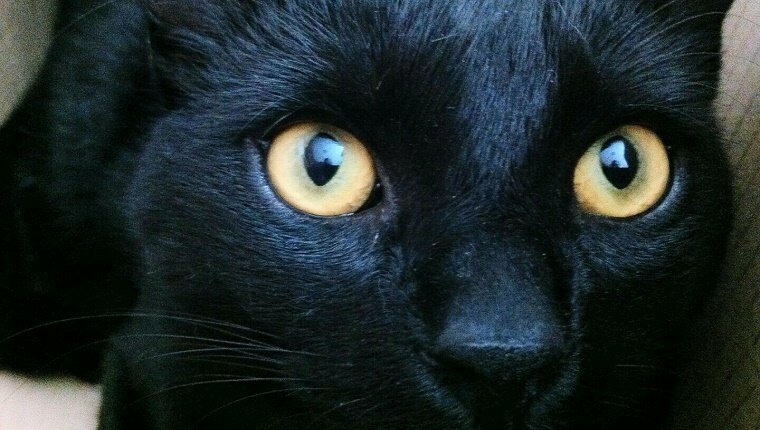 As a cat owner, you should pay close attention to the health of your kitty’s eyes. 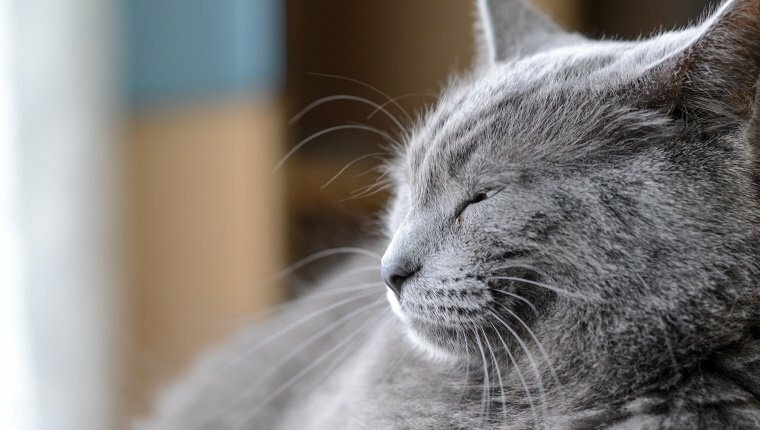 Here are the most important things that you should know about your cat’s vision. The signs of healthy cat eyes are fairly easy to spot. They include wide, open eyes that have no obvious redness or discoloration, such as brown splotches. The pupils should be the same size. They should only be large if your cat is in low light or feeling scared. There should be no discharge coming from the eyes, except for a little brown sleep in her eyes from time to time. 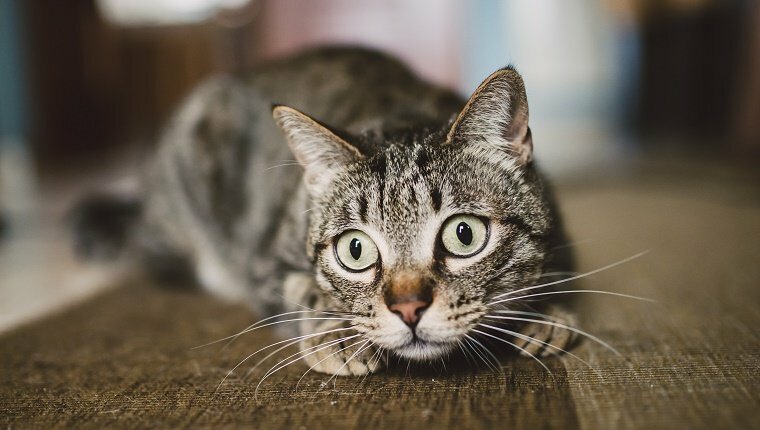 If you see any of these problems with your cat’s eyes, then you should take her to the vet for a checkup. Squinting eyes: Sure, cats may squint their eyes on occasion, such as in very bright light. But if she’s never opening her eyes fully, it may be a sign that she feels pain or her eye was scratched. Crusty discharge: If your cat has a lot of crusty discharge around her eyes, this could be a sign that her eyes are very sick. Red eyes: If your cat’s eyes are red or cloudy, take her to the vet. Upper respiratory infections can cause eye discharge that’s pus-like. Your cat may paw at her eye if she’s feeling uncomfortable. Pink eye can cause your cat’s eyes to look red and swollen and have a thick discharge. A scratched cornea can cause your cat to blink too frequently and it can lead to her eyes having discharge or tearing up. Allergies can also cause similar symptoms. 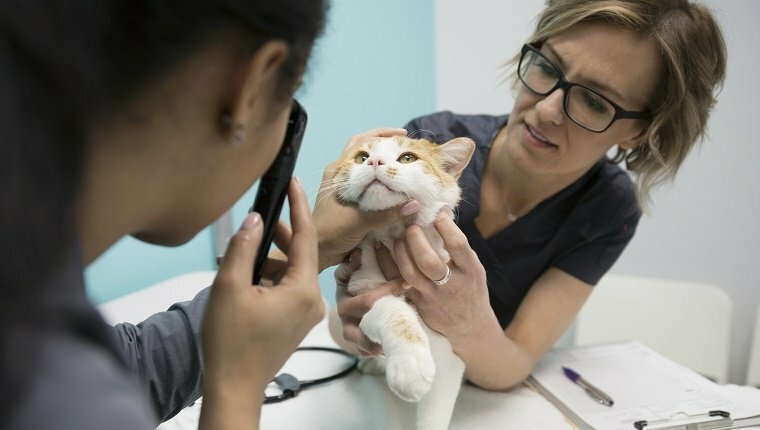 FIV, FeLV, FIP, and even feline herpes can cause eye problems. Your vet may consider these possibilities if your cat’s eyes exhibit symptoms. Cataracts can cause your cat’s eyes to look cloudy and lead to a loss of vision. Glaucoma is caused by excessive fluid pressure on the eyeball. Humans can develop this and so can cats. It can be serious if not treated. Remember, if you have any doubts about your cat’s vision, take her to the vet right away. You don’t want to risk something that is so precious to your kitty! 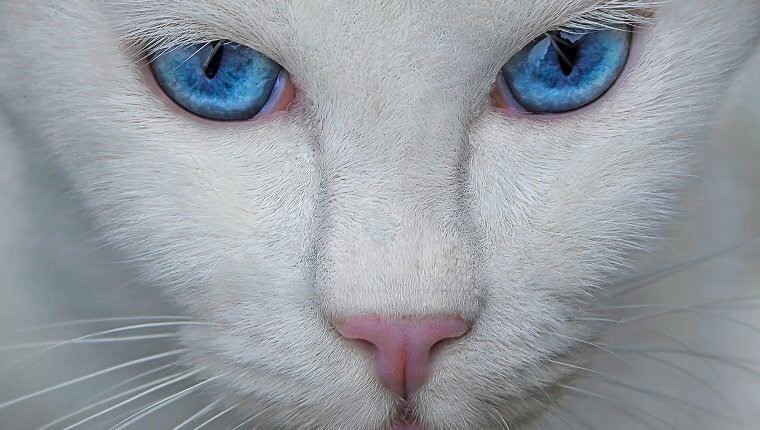 If you have a white cat with blue eyes, her vision is likely fine. But her hearing probably isn’t. Cats that are completely white in color that also have blue eyes are often deaf or hearing-impaired. These cats should be checked by your vet for hearing problems. Not all white cats are albinos. 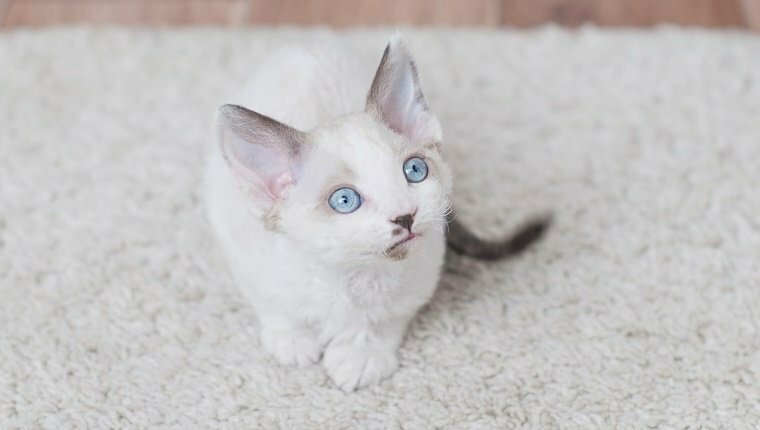 Cats who are true albinos will have very, very pale blue eyes or pinkish eyes. Albino cats may not have great depth perception. Their vision will also be very sensitive to direct sunlight (and their skin will be sensitive, too.) Try to keep your albino cat indoors and away from direct sunlight, so she’s not injured. A simple test can let you know if your cat’s vision is degenerating. All you need is a pen light and some cotton or a feather, according to The Nest. First, move your hand very slowly toward your cat’s eyes to see if she blinks or turns away. Next, shine a small, bright pen light in her eye and see if she turns, blinks, or squints. See if her pupils constrict when exposed to light, as they should. Drop a feather or small piece of cotton in front of her to see if she watches it fall to the ground. Try placing objects in front of the places where your cat typically walks, to see if she bumps into things that aren’t in their proper place. If your cat’s pupils don’t react to light or if she doesn’t react to any of these tests, something could be wrong. If she bumps into unfamiliar items, this could also be a sign that something’s off. Take her to the vet for a checkup. Remember, if you have any doubt at all, take your cat to the vet. Her eyesight is precious and should be protected.